I rarely play video games anymore. I’m too busy viewing and reviewing movies, but during the last week of 2016, I started and finished HALO: Reach, only because I was laid up with a back injury. The pain had prevented me from sitting and writing, but I could lay down and lose myself in a video games vortex and as I played I was reminded how life-like these games have gotten. I probably sound like an old man, but I’m well aware that video game graphics have had a cinematic look for years now. In fact, the storylines that some of these games can be just as dense and expansive as some of the genre flicks that make it to the big screen, sometimes they’re even better. All this has me wondering why Hollywood producers continue to pursue video game properties. I’m well aware that the current state of the movie industry finds studios clamoring for brand recognition, but when’s the last time a movie adaptation of a video game has been any good? I’m not really keeping track, but the last video game movie was released earlier this summer, the CGI-leaden fantasy epic, “Warcraft“, and despite a director with proven talent behind it, the end result was kind of a confusing mess, albeit a good-looking one. Universal Pictures were banking on faithful fans of the Warcraft series of games filling seats in theaters, for their $165 million budgeted blockbuster, but the critically-panned movie only made $47.2 million in the States. That doesn’t matter anymore, when a movie like this can make $386.4 million overseas, which means a sequel is guaranteed. Now, we have “Assassin’s Creed”, based on another highly successful series of action/adventure video games, with 20th Century Fox counting on the same scenario as “Warcraft” – meaning, it doesn’t matter if this movie receives poor reviews, if it can surpass its budget globally then its not just a success, but a profitable kickoff to a potential franchise. 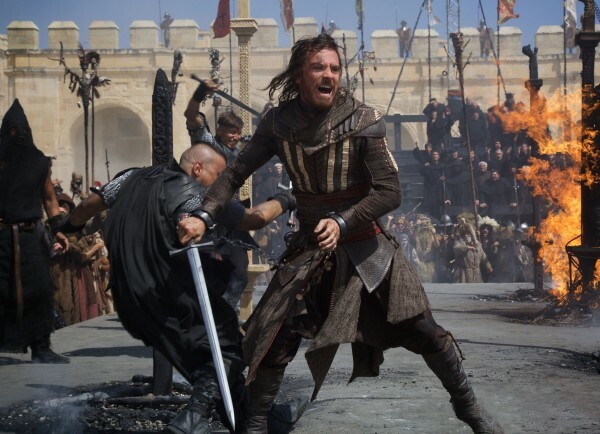 The same cannot be said for “Assassin’s Creed” which placed fifth during it’s opening weekend in the States and to date has earned $86.8 million, making it highly unlikely it will recoup it’s $125 million budget or make any profit beyond that amount during its international run. However, both these movies have similar problems in that they induce a certain degree of head-scratching for the uninitiated. Some say movies like these are ‘for the fans’, yet they fail to realize a movie should stand on its own and not necessarily be limited to the source material. Unfortunately, in the case of “Assassin’s Creed”, the source material is dense, somewhat convoluted and not as easy to adapt to the big screen as 20th Century Fox had hoped. It’s certainly not as confusing and flawed as “Warcraft,” but there is a noticeable confidence to the movie that adds a certain cinematic heft to it, regardless of whether or not I knew what was going on the entire time. It’s an overambitious movie with solid action sequences (although, I’m guessing gamers will want more) that tries to inject a sense of layered history to its characters, yet overall winds up being kind of uninteresting, despite its impressive cast. 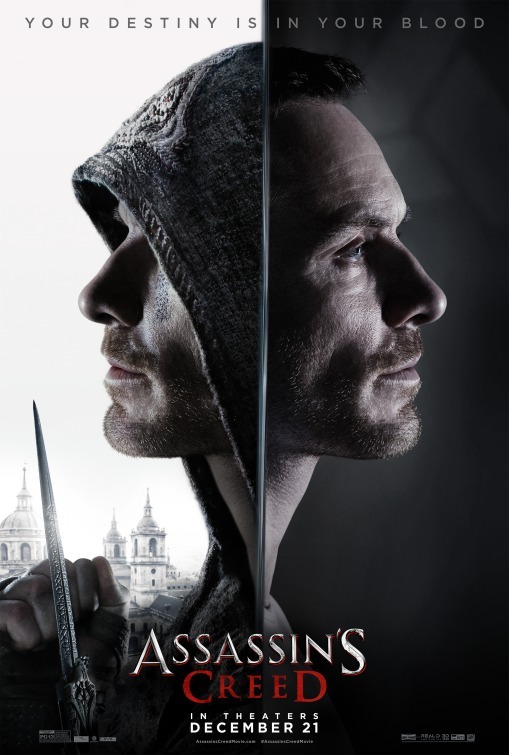 The movie opens in 1492, during the Spanish Inquisition, where we’re introduced to Aguilar de Nerha (Michael Fassbender) is accepted into the hooded and robed Brotherhood, a secret order of assassins that has opposed the Templar Order for centuries. Why? I’m not sure, but let’s go with it. During this set-up, Aguilar has his ring finger cut off to make way for a trademark hidden blade that he’ll be suited with. After what is a seemingly traditional initiation, he is given a mission to protect the Prince of Granada. Again, not sure why. Flash forward to 1986 New Mexico, where we see a young Callum Lynch return home to just after his father, Joseph Lynch, has killed his mother – we later learn his father was member of the Assassin Order. But why he killed his wife, Cal’s mom, is – you guessed it – unclear. Cal flees the scene as gunmen working with the Abstergo Foundation, apparently a modern-day front for Templar activity, zero in on Joseph (Brian Gleeson, son of Brendan). As Cal escapes, we notice the mysterious leader of these gunman watching him leap across building tops, an acrobatic feat that tells viewers this is our guy at a young age and such physical prowess will play out soon enough. Thirty years later, Cal (Fassbender) is on death row for murder and after he receives a lethal injection, he awakens inside a fortress somewhere in Spain. Through some fuzzy exposition from Sophia Rikkin (Marion Cotillard), the lead scientist of the Animus project at Abstergo, Cal is told that he’s essentially been resurrected to be a test subject, which has something to do with the study and eradication of violence in humans. Truth is, Cal was picked because his DNA offers a direct lineage to the Assassin’s Brotherhood, a cult devoted to preserving peace through free will (and wicked martial arts). 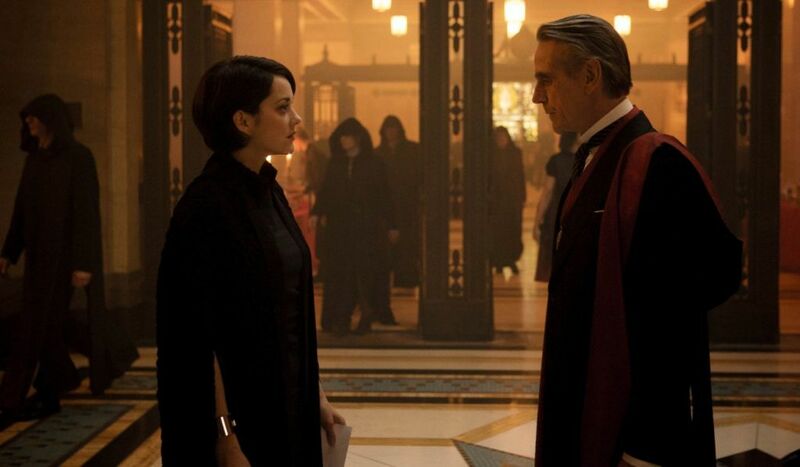 What Sophia and her father, Dr. Alan Rikkin (Jeremy Irons) require of Cal, is to go back in time and protect the Apple of Eden, a MacGuffin that was created by an ancient civilization and contains a genetic code for free will, that could put an end to the man’s propensity toward violence (I had to look that up – you’re welcome). Wait – ‘put an end’ how? I’m not sure – a sentiment I had to continuously resolve myself to throughout this movie. As you can tell, screenwriters Michael Lesslie, Adam Cooper and Bill Collage, aren’t too concerned with answering questions or even hinting at answers in “Assassin’s Creed”. The two introductions feel like the kind of story interludes you’d find in-between levels of an actual video game and not much more beyond that. Going back in time is where the movie gets unique, but there isn’t much time spent on who Aguilar is and what motivates him. If you’re at all familiar with the games, you’ll know that Cal doesn’t jump into a DeLorean to go back in time – no, he’s hooked up to a machine called the Animus that taps into his brain and spinal column, shocking him into reliving the life of Aquilar back in 1492. With his erstwhile colleague, Maria (Ariane Labed), is tasked with protecting the Apple of Eden (another explanation for this bizarre doohickey is that it’s the key to human behavior – how and why? I don’t know) from the Templar Order. Sophia may work with her father, but he may not be completely transparent with her, something we discover when we learn that he’s been keeping Cal’s father (Brendan Gleeson) and conspiring with his superior, Ellen Kaye (Charlotte Rampling), to shut down project Animus. There are other assassin’s being held at the Abstergo facility, some of them apparently had been plugged into the Animus project as well, but it’s unclear what they’re task was. Where they going after the Apple of Eden as well and failed? Guess what? I don’t know. Among those discarded ‘guests’ is Moussa (Michael K. Williams, who also plays Haitian assassin, Baptiste, in the 1492 period), who is looking to plan a riot with the other assassin’s in order to escape the facility. And then do what exactly? I don’t know. So what are the stakes for our hero, Cal? Well, he runs the risk of having his mind permanently merged with this Aquilar guy – but hey, at least they’re in the same gene pool. Maybe those who are well-versed in the Assassin’s Creed line of video games or members of the fan club (there’s bound to be one) will be able to follow along with what’s going on in this movie, but most of it was lost on me. Still, it’s certainly not the worst video game adaptation I’ve seen and there was surprisingly enough here for me to appreciate (or it could be I just had low expectations going in) and lose myself for a bit. The cast alone is impressive and fun to watch, even if they’re kind of slumming it with this silly material. A lack of substance is definitely something of a departure for Australian director Justin Kurzel, who had previously worked with Fassbender and Cotillard on last year’s iteration of “Macbeth“. This clearly isn’t Shakespeare and maybe they needed mindless escapism after being immersed in dense Elizabethan prose. This material could’ve easily dipped into pure camp, but Kurzel’s takes this adaptation seriously. That could be to the movie’s detriment, but the commitment here is admirable despite the content being baffling and ultimately, uninteresting. Kunzel reunites with his “Macbeth” cinematographer Adam Arkapaw (who also lensed “The Light Between Oceans“) and you can tell by the earth tones and smoky set pieces that are shrouded in shadows and darkness. That may work for video games, but not so much when you’re trying to figure out what’s going on in a movie. Kunzel also reteams with his brother, composer Jed Kurzel (who scored “Macbeth” and other Fassbender joints like “Slow West” and the upcoming “Alien: Covenant”), who supplies the film with a sometimes elegant Middle Eastern vibe, yet it’s mostly a glaringly loud accompaniment that’ll jolt viewers into submission. If this were released in the 80s, a movie like this would’ve been scored by Brian May or Toto. Considering all the elements at play here, maybe “Assassin’s Creed” could’ve benefited from a little levity, or at least an attempt at some. The movie’s mixture of sci-fi and historical fantasy is aligned with the video games, yet that mashup of genres seems more appealing on the big-screen than it does on any at-home screen – at least from what I’ve seen. It’s one thing to play such a game, but here we have Fassbender’s character being forced to essentially play the kind of character a gamer would play in the story of the movie. That aspect is cool, but it’s not enough to save viewers from the frustration of convoluted plot points and endless exposition. 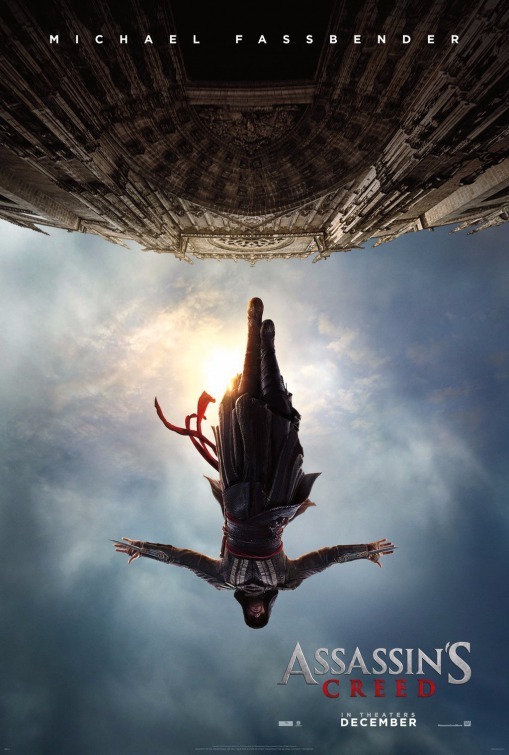 While the talented cast makes the movie tolerable, it doesn’t necessarily make it bearable.Visually appealing and somewhat provocative, “Assassin’s Creed” concludes with a dull ending that seems like it just doesn’t care whether or not there’s a sequel. That’s certainly a conclusion most viewers will agree with.